When you need to experiment with different configurations when designing any kind of electronic product or device, having a general supply of parts on hand is very beneficial. 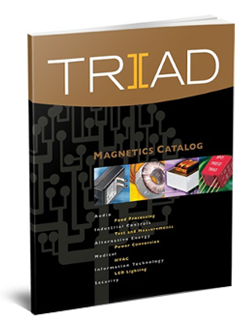 Triad Magnetics offers a full range of custom magnetics, along with thousands of part numbers that are off-the-shelf standard. We have development and design sample kits available across our product lines of high-frequency transformers and inductors. Whether you’re a serious hobbyist, in an educational setting, or are involved in professional OEM engineering design, these engineering development kits are ideal for putting active solutions to passive component requirements at your fingertips. Triad’s sample kits contain samples representative of products across our entire product catalog of high-frequency inductors and transformers, each one organized by product type. Each kit includes a full sampling of values, sizes, and packaging styles available for purchase within a particular product line. Kits like these can be useful for a variety of developmental and design needs, including agency evaluation, circuit testing, circuit simulation, and prototyping. All items feature appropriate agency approvals and meet all specifications listed in the catalog section referring to the product. The kits are housed in a clear polycarbonate box that’s easy to see and store and comes equipped with a convenient hinged lid that snaps shut. CST206K Engineering Development and Design Sample Kit: Contains representative samples of our CST206 series of high frequency current sense transformers. All kits contain two of each part. CST306K Engineering Development and Design Sample Kit: Contains representative samples of our CST306 series of high frequency current sense transformers. All kits contain two of each part. GDE25K Engineering Development and Design Sample Kit: Contains representative samples of our high frequency Gate Drive transformers. All kits contain two of each part. CMT8100K Engineering Development and Design Sample Kit: Contains representative samples of our CMT8100 Common Mode Inductors. All kits contain two of each part. FITK Engineering Development and Design Sample Kit: contains representative samples of our high frequency Toroidal Inductors. All kits contain two of each part. CME2425K Engineering Development and Design Sample Kit: contains representative samples of our high frequency CME2425 Common Mode Inductors. All kits contain two of each part. CMT908K Engineering Development and Design Sample Kit: contains representative samples of our high frequency CMT908 Common Mode Inductors. All kits contain two of each part. CME375K Engineering Development and Design Sample Kit: contains representative samples of our high frequency CME375 Common Mode Inductors. All kits contain two of each part. FIRCHK Engineering Development and Design Sample Kit: contains representative samples of our high frequency FIRCH Rod Core Inductors. All kits contain two of each part. RCK Engineering Development and Design Sample Kit: contains representative samples of our high frequency RC Rod Core Inductors. All kits contain two of each part. CMF16K Engineering Development and Design Sample Kit: contains representative samples of our CMF16 Common Mode frame chokes. All kits contain two of each part. CMF23HK Engineering Development and Design Sample Kit: contains representative samples of our CMF23H Common Mode frame chokes. All kits contain two of each part. CMF23VK Engineering Development and Design Sample Kit: contains representative samples of our CMF23V Common Mode frame chokes. All kits contain two of each part. Get the supply of components you need to move your development and design projects forward by browsing our online catalog of engineering development and design sample kits.